Empty Barge = Swimming Pool? HUH? In a city like Berlin, where you aren’t trapped by millions of rules and laws dictating what you can and can’t do, people tend to get creative. Is that a barge floating in the river? Yes, yes it is! A short subway ride away from the center of Berlin (Mitte) floats the answer for a hot, summer Berlin day! An empty old barge turned into a floating swimming pool in the middle of Berlin’s Spree River. 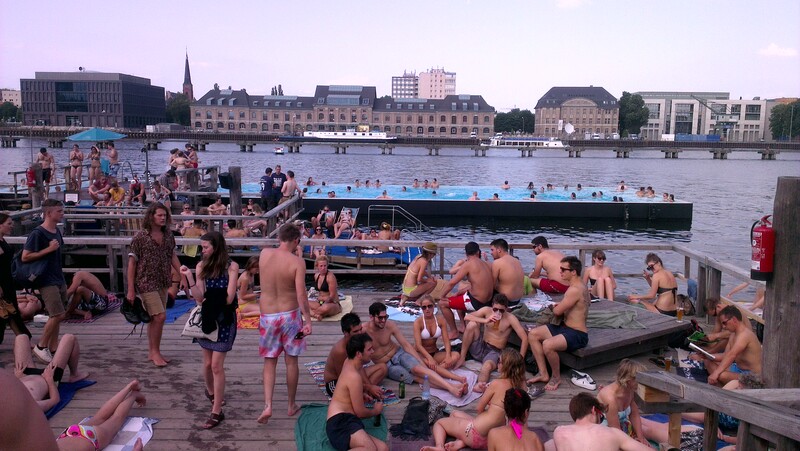 We checked out the Berlin Badeschiff last Saturday and were amazed that it wasn’t already packed with people by 12pm. In Canada (or in Stuttgart, I think! ), people would have staked out their spots by 10am…but Berlin is a slow city – and people wake up late, especially on the weekends. We scored a prime spot and enjoyed a couple of hours with only a few people. 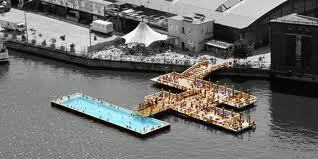 The dock area is not that big, but there is also a big sand area with a bar and other sitting areas. It started to get pretty busy around 2:30pm or so and that’s when we slowly started to make a move. I remember how hard it was in New York to find anything with a pool in the city on a summer day – well anything that was decently affordable. But another thing I love about Berlin, this lovely pool had an attractive entry fee of 4 Euros (3 Euros for students) for all day. Plus I love its hours – “8am till late” – I think that means you can actually party at the pool late into the night. And if you don’t like the pool, you can go to Club de Visionaire around the corner which is a pumping club pretty much 24 hours a day. What a city!